We moved to Hyderabad last month, and I have not been regular with my posts! new city, new routines, new lifestyles, all of them have kept me quite busy. A few days back on my way back home I saw fresh red chillies (not the dry ones) and thought of making some achar (pickle) out of it. I tried not to use oil, but figured it would not stay for long and would not taste as good. Hence this is what I did. Wash and dry the red chillies and chop them, peel the garlic, and extract juice from the limes and keep aside. Coarse grind the mustard seeds, dry roast the cumin and fenugreek and coarsely grind them as well. Add all of them to the chopped red chillies and peeled garlic cloves along with the lime juice, red chillie powder, turmeric powder and salt. 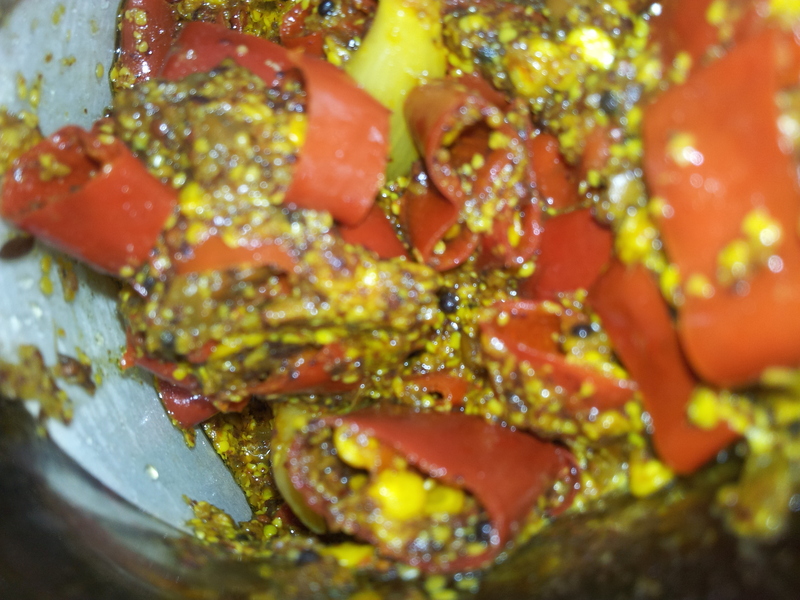 In a small wok heat mustard oil, add a few cumin seeds, mustard seeds and the asafoetida. Once the seeds start to splutter remove from heat and allow it to cool. Once the oil cools add it to the red chillies. Store it in a glass jar and keep it in the sun.